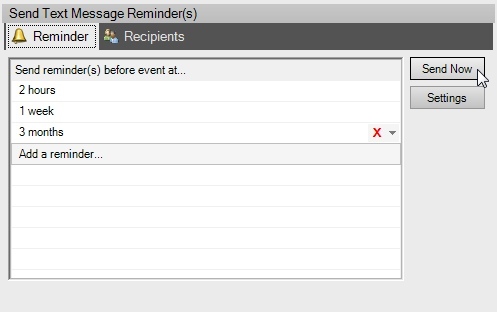 Click the "Send text message reminder(s)" box on the Actions tab of the Event Editor or Reminders tab of the Task Editor. Click the "Send text message reminder(s)" box on the "Event Defaults" tab of the Event Calendar Properties window or "Task Defaults" tab of the Task Calendar Properties window. Events and tasks can be set up to send an SMS text message reminder. To enable a text message reminder, check the "Send text message reminder(s)" box in the list of available actions on the Event Editor or Task Editor window. Note that VueSoft does not charge anything to send text message reminders. However, depending on your mobile carrier and the mobile carriers of your recipients, additional fees may apply. VueSoft is in no way responsible for any of these charges. This disclaimer is part of the license agreement that must be accepted before VueMinder can be installed. One or more reminders can be scheduled for the same event or task. 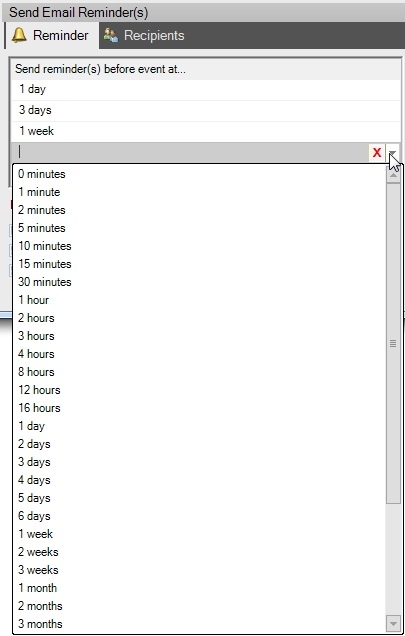 To schedule a reminder, select a time from the drop-down list or type in a value. When typing in a value, the number must come first, followed by a space and then the unit of time (minutes, hours, days, weeks, or months). Example: "5.5 hours". Valid times can be anywhere between 0 minutes and 1 year. You can also specify negative times to make the text message be sent after the event or task starts. To remove a scheduled reminder, click the red X button. If you'd like to send the text message reminder manually, you can do so with the Send Now button. The reminder will be sent to the recipients specified on the Recipients tab. It may take several seconds for the text message to be transmitted from VueMinder. A status message will be displayed at the bottom of the screen showing the transmission status and whether or not it was successful. If unsuccessful, you could have a problem with your email or text messaging settings, which can be accessed using the Settings button. Depending on your mobile carrier and network, there could be an additional delay before the message appears on your phone. This delay can vary between a few seconds and a few minutes. If you don't receive the reminder within about 5 minutes, then your settings may be incorrect. The text message reminder will also be sent automatically at the specified time before the event or task, regardless of whether it was sent manually. Text message reminders can be sent to yourself, additional recipients, distribution lists, or contact groups. Also, any combination of these can be specified. 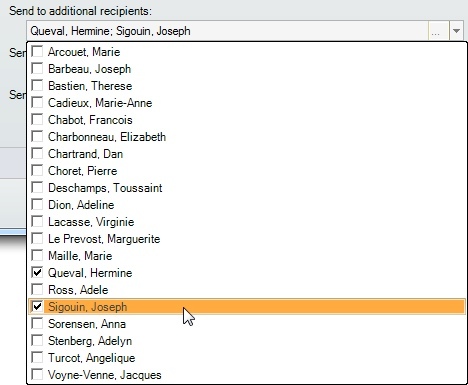 For example, you can select individual recipients in addition to one or more distribution lists. Check this box to send the text message to yourself. This requires your phone number to be specified on the Text Messaging Settings window. You can specify individual contacts to receive the reminder. When clicking this field, a drop-down list of contacts will be shown. Use the checkboxes to select the desired contacts. If you need to add a new contact, click the "..." button to access the Contact Editor, where a new contact can be defined. Contacts must have a mobile phone number specified in order to receive the reminder. The Contact Editor contains a "Group/category" field. If this field is used, you'll see a drop-down list of the currently used contact groups. Use the checkboxes to select the desired contact groups. This can be used as an alternative to distribution lists. Any contacts associated with the selected group(s) will receive the reminder, provided their mobile phone number and mobile carrier have been specified.